About a week ago I went to the market looking for cuts of beef to cook some steaks and was shocked at the prices, even for the cuts that I would not consider very good for steak. Seeing that pork on the other hand was much more affordable my taste quickly changed to craving pork instead of beef. Funny how that works. I picked up a 5 lb tray of pork ribs, put half in the freezer, and made the other half for dinner. I don’t really follow any recipes and sort of throw things together but here is my best recollection of what I did. I think I first learned how to make this from theallamericanchinesecookbook.com and simply made some minor changes to suit my taste. Put all ingredients except the pork in a 1 gallon ziploc bag. Seal the bag and shake vigorously from side to side to mix it all up. Add the pork to the bag, seal, and marinate in the refrigerator for at least 4-6 hours, or overnight. Turn the bag over a couple of times a few hours apart if you remember to spread the marinade around. Remove the bag from the fridge about 20-30 minutes before cooking to bring it to room temperature. Pre-heat the oven to 325 F. Remove the pork from the bag (or whatever you used to marinate in) and reserve the marinade in a bowl. Cover a roasting pan with foil if desired – it makes it easier to clean – and put the pork in the oven. After one hour baste the pork with some of the marinade you put aside (on both sides!) and put the pork back in the oven for another 20 minutes. Repeat the basting process, put the pork in the oven for another 20 minutes, then remove and let rest loosely tented in foil for about 15 minutes so the juices redistribute throughout the meat. Serving suggestion: serve with rice and a quick vegetable stir fry. Note: While I include the marination process here – which I am doing today – I actually skipped it the day I bought the pork as I did not have the time. I prepared the marinade as described above, rubbed the pork with salt and pepper and put it in the oven, then did 3 rounds of basting after 40 minutes of cooking for a total of 1 hour 40 minutes. I prefer to marinade when possible but it certainly was nothing to spit at and the family really liked it served with rice. 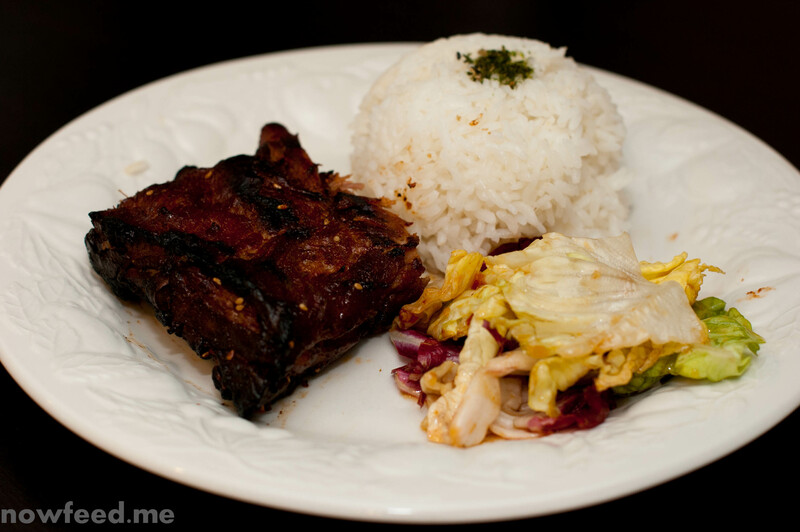 This entry was posted in Food, Recipes and tagged asian, Chinese, gluten-free, pork, ribs. Bookmark the permalink.